You are standing in an antechamber now. Ahead stretches a series of long hallways where you can see various amazing skeletons. In front of you is a map. It is not your usual map. It is a map that paleontologists use all the time to understand how animals are related to each other through time. This map is called a cladogram, and this particular cladogram shows the relationships among the archosaurs. Each box is a monophyletic taxon  a grouping that includes all descendants, living and/or extinct, known and unknown, of an inferred common ancestor. Those boxes with pictures will take you to an exhibit, while those that are grayed out do not have an exhibit as yet. Those boxes which are a lighter blue (or lighter gray) are groups which do not belong to the Archosauria proper, but are close relatives. The cladogram depicts the evolutionary relationships between some major groups of archosaurs ("ruling reptiles") and their relatives. Near the base of the tree are the Champsosauridae  there is no page on this group as yet, but it includes a bizarre menagerie of aquatic reptiles that survived the extinction of the giant dinosaurs at the end of the Cretaceous. You will then find the small terrestrial reptile Euparkeria the next step up the cladogram. It is one of the closest known relatives to the true archosaurs, and looks a lot like what we think the first archosaur must have looked like. However, it is distinct enough that we can be confident that it is not the common ancestor of all archosaurs, and is just an early side branch outside of the Archosauria proper. 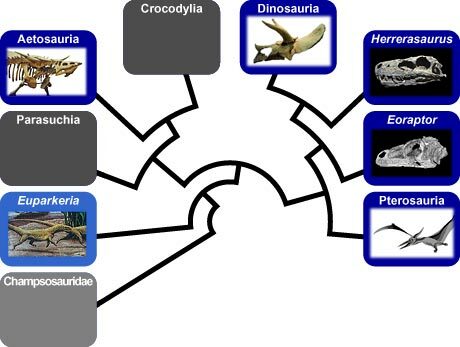 The remainder of the animals on the cladogram are all archosaurs, comprising two major groups that correspond to the two branches of the cladogram leading from the archosaur node. One is called the Ornithosuchia, or "bird crocodiles." It includes all archosaurs more closely related to birds and other dinosaurs than to crocodiles. The second branch is the Pseudosuchia, or "false crocodiles." It includes all archosaurs more closely related to crocodiles than to birds and other dinosaurs. Note that this does include the crocodiles, so crocodiles are "false crocodiles." This is an unfortunate consequence of a sordid taxonomic history. Just remember it's only a name. Click on one of the pictured archosaurs above to begin your journey into the world of the ruling reptiles. How do scientists construct cladograms like this one? Look at how biologists reconstruct the pattern of events that led to the diversity of life. Learn why this is so important for understanding organisms and how they evolve.